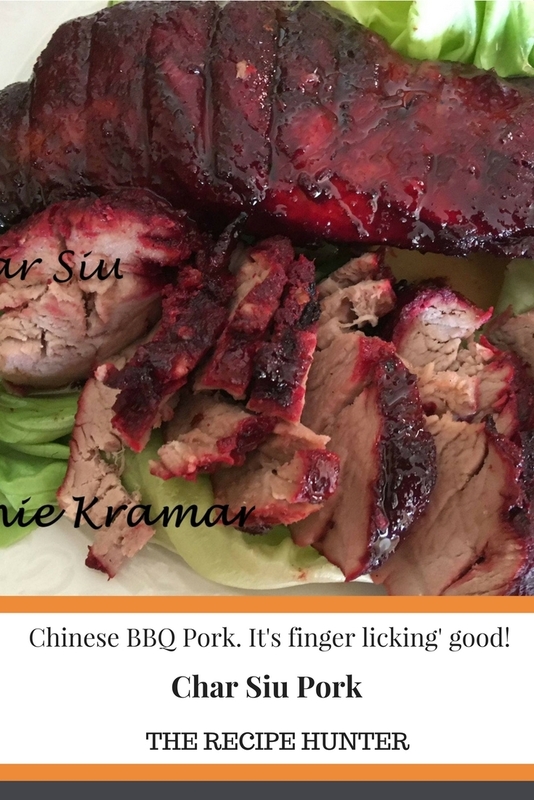 Char siu is a popular way to flavor and to prepare barbecued pork in Cantonese cuisine. It is classified as a type of siu mei, Cantonese roasted meat. My ex-father-in-law (who was Chinese) used to without fail go to Chinatown in downtown Johannesburg on a Saturday, and go to the Chinese deli and buy us a whole lot of dim sum and my favorite was always the Char Siu Pork. I always wanted to learn how to make it, and it took me years to finally get it down to how I remembered it. Particularly how they got it that red color. I found out that simple red food coloring was a perfectly good substitute for the juice of red bean curd. 2 pieces of pork fillet. Prick all over with a big fork. Add the pork fillet to a ziplock bag. Mix all of the above and add to fillets. Mix to coat and seal and refrigerate bag overnight or a few hours. Place on wire rack, with a tray lined with foil to catch the drippings. Turn around and baste both sides and bake another 25 minutes. Brush with honey water (2 tblsp honey and 2 tblsp room temperature water) and bake another 1 minute). That looks good! 🙂 Thanks for the recipe.